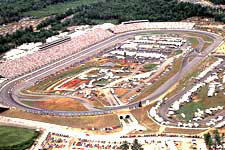 The two NASCAR Winston Cup Series races at New Hampshire International Speedway continued as New England's largest spectator sporting events with well over 90,000 in attendance at both in 1998. In addition to the NASCAR Winston Cup Series event, the NASCAR Busch North Series Grand National Division and Featherlite Modified Series, NASCAR Touring races also draw big crowds. Track management has continued to improve the speedway's accessibility by adding 50 additional acres for free parking. NHIS hosts NASCAR Busch Series, Busch North Series, NASCAR Touring and Featherlite Modified Series, NASCAR Touring races as well as AMA motorcycle, vintage car and club events. Location: From I-93 in Concord, N.H., I-393 to exit 3 -- Route 106 North 9 miles. Located one hour from Boston, two hours from Portland, Maine, and Providence, R.I., with easy access from Vermont and Canada via I-89.